Searching is about a father looking for his missing teenage daughter. When David Kim (John Cho, who looks perpetually worried) isn't satisfied with the efforts of the police to find his lost fifteen-year-old Margot (Michelle La, who looks older than that), he redoubles his own online efforts, analyzing and re-analyzing the data he finds, with surprising results. This movie is varied and ingenious in its use of multiple platforms and media to get at secrets hidden in plain sight, following a new convention of filtering live action always through secondary sources. Searching, an online thriller, is in that modern. It plays with Google, social media, and computer files. It's one of a new genre of all- or nearly-all online action, like, but better than, the unpleasant Unfriended. (In fact distributors seem to see Searching as a horror movie like Unfriended - though it's not - jugging by the horror movie trailers that proceeded it.) But Unfriended was different in content and method. It was about people being cruel on social media, cyber bullying. Searching is more human and nicer. It's also more ingenious and multi (mostly cyber) media, blending in phone chats, footage recorded on multiple CCTV home spy cameras, even the occasional local TV newscast. But at bottom, Searching is still a good old fashioned mystery story. Like many of those, you can predict how it's going to end, but not - and that's the fun part - how you'll get there, which with luck can catch you off guard. In fact even the desktop-bound cyber supernatural horror tale, Unfriended, was a social-media reworking of mystery master Agatha Christie's And Then There Were None. There's nothing new under the sun - or inside the tube - when it comes to crime stories. This isn't as much fun as Agatha Christie. But it has its own kind of contempo authenticity. As Searching begins, we meet David Kim,), a Korean-American, who's been living for a few years now with his fifteen-year-old daughter, Margot (Michelle La). But right away movie takes us back to an earlier Kim family computer (the first background sound is the sweet music of a dial-up connection slowly firing up). From there, it shows us the preserved videos of little Margot's earliest days. We see her as a babe, then at 5, 7, and 9. Not only that. It shows us how later on, as Margot is growing up, beautiful (also Korean-American) wife and mom Pam (Sara Sohn) is diagnosed with lymphoma; works out running to stay strong; has remission; runs again; but then becomes ill again and stays ill. The last stage of her sad decline and passing is poignantly chronicled (symbolized?) simply by seeing the cursor, wielded by David, repeatedly moving forward the hopeful words, "returns home from hospital" to later dates on his online calendar, as Pam doesn't get better after all. David and Margot now live in the chill of a shared bereavement that somehow their chipper current phone messages show they can't quite seem to share. Maybe they need to sit down for a heart to heart talk. But the communication we see is canned. This opening passage tugs our heartstrings, gives the movie welcome emotional heft far beyond empty social media chatter, and sets up the home situation David and Margot are living in. After Margot doesn't return home, David tries to contact people who'd know what's happened. At first, Friday afternoon, he realizes there's nothing odd about her being out: it's the time of her piano lesson! But when he phones the piano teacher, Mrs. Shahinian (Sylvia Minassian), whose number he finds online, it's only to learn that Margot cancelled the lessons six months ago. Yet he's been giving her $100 a week for the lessons. Where did the money go? She had said she was at a AP science study party. When David calls her hostess, the girl, and later another guy, both reveal they don't know Margot well, and that she left early in the evening. Then David knows Margot is missing, it's serious. And also, little by little, it dawns on him that he did not know his daughter. Enter Detective Vick (Debra Messing), who takes charge of the police investigation of Margot's disappearance. Margot has left her laptop on the kitchen counter. David clearly has some cyber-savvy, and quickly finds his way into Martot's gmail, Facebook, and Tumblr, the latter a site he's never heard of, and another one we've never heard of, on which Margot has recently been having frequent conversations with somebody in Pennsylvania who works as a waitress. Who these people are, or aren't, gradually unfolds, as do Margot's recent actions on that night. Both in person and online, she is a will-o'-the-wisp, but her father begins to find her, working in a strange kind of cooperation-competition with Detective Vick. 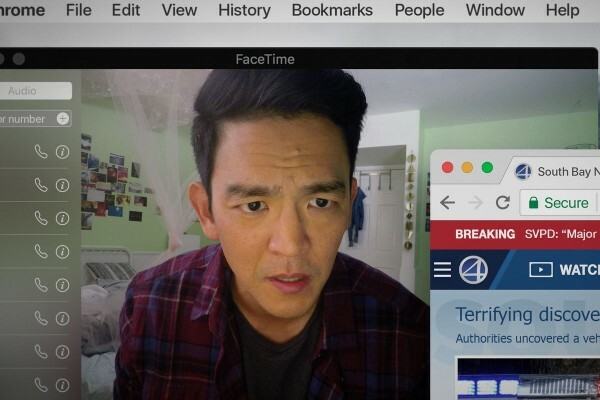 Searching gets away from the minimalism of Unfriended. In a way it's a found footage film, like Blair Witch Project. It has a beginning, a middle, and an end, with some nice moments in between. As contrived as its ending is, it's good far-fetched fun. Certainly going through computer video files is better than rummaging through the files detectives used to be confined to. Sill, all the absorption in files is drier than pure Blair Witch-style found footage, which plunges us deep in ongoing action. But this is more investigative, exploratory, essential mystery-story stuff. Chaganty brings up, without their seeming overt, some obvious themes: alienated youth; parent-child communication revealed to be illusory; our ever-more complex dependence on social media, computers, and the internet. Cyber-filming is still basically claustrophobic, on the face of it a closing-down of narrative rather than an opening-up of it. But Chaganty and cowriter Sev Ohanian tell a lively tale, even if, in the realm of character development and a sense of place, the old non-cyber method still works better. What does come out, if only in passing, is the falsity of the social media crowds, the lies, the trolling, the fake identities, the love or admiration that are only pretenses to attract the attention of the cyber-masses, the hit-seekers. Searching, 102 mins., debuted at Sundance Jan. 2018, showing in eleven other festivals. It opened in uS theaters 31 Aug. 2018. Metascore: 72%.